There are a few of us work on two, three, or even more computers at any one time. The cost of all those computers is one thing, but the cost of all those computers and monitors and keyboards and mice can be almost double - not to mention taking up lots of space. What to do, you wonder? Well LinkSys have a solution in the form of their ProConnect 4-Port Compact KVM Switch. The unit lets you toggle between all these computers with just one mouse, keyboard and monitor. Since no drivers are included, or for that matter necessary, the unit basically just plugs in and is ready to go. However unlike the two port unit, you will need to buy all the cables to use with this switch. This is a bit annoying, and translates into added costs, especially if you are just setting up the console to control you computers. I guess the rational is that users getting the 4-port KVM switch will already have a couple of the cables. We would have liked to have seen Linksys included them however. Switch between four PC's can be done with the press of a button located on one end of the unit. To use the console properly the monitor must be set to the highest resolution that you will be using on any of the four computers. To begin using the console it is simply a matter of connecting up all the computers to the right ports. There are four ports to connect up the computers, and one specifically to control the console. The LED's will light up to indicate which computer is being controlled by the console incase you forget. To move from one computer to another the button on the console can be toggled. Given the number of cables that are going into the console this really isn't very realistic. It is better suited to sit in the back of a desk, rather then atop in an easily accessible location. Toggling can be done from the keyboard by hitting Alt-Ctrl-Shift and then choosing a computer between 1 and 4. For those of you who need to constantly monitor all four computers this would get tiring really fast. To help make things easier an AutoScan feature is built into the KVM switch. By pressing alt-ctrl-shift-0 it will be set to go through each computer in intervals of a few seconds. Finally there is a hot key function which enables the KVN switch to manually cycle through the list of computers by means of a single key. The all to familiar alt-ctrl-shift combo with 9 brings up the ability to move via the left and right shift keys. 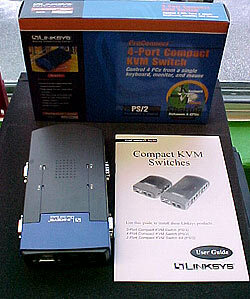 All in all the 4-port KVM switch is a cool product to have, and works well. Our only concern has to do with the fact that it ships with out any of the cables, and to get those cables costs $20 per set. So while the retail cost is only $80, the actual cost is going to be more around $160. A good product, but needs more accessories included.